Plaques such as this one, commemorating a loved one’s tragic death, used to be commonplace until legislation was introduced banning them. Thankfully, it has to be added, because it is a rather morbid ritual. Yet there is a small element of regret at their passing. 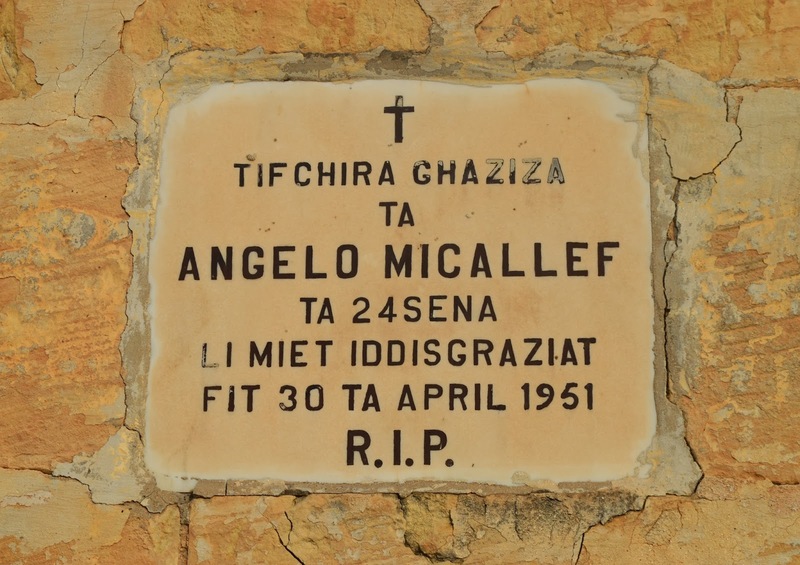 Take this plaque, for instance, which commemorates the death of Angelo Micallef in 1951. It states that he died “iddisgrazjat” which, translated literally, means in disgrace but probably a more accurate translation would be tragically. Let’s put that down to a particular use of the word that has been lost over the decades, shall we? After all, the word “tifchira” (in memory) is written with the Italian influenced “ch” instead of the “k” as modern orthography dictates. Even with the few words that it contains, this plaque is a mirror into the past. But perhaps what is more interesting is the sentiment that it elicits. Whoever paid to put the plaque up must have been heartbroken at the death of a loved one and wanted a memorial that would act as a reminder. Yet they’ve achieved more than that. Over sixty years have passed from the incident and in all probability there are few people alive who remember Angelo Micallef, if any. But it doesn’t matter because anyone who passes by and sees the plaque will think of him even if briefly. In this manner someone who was unable to make a mark in his lifetime has, in death, been afforded that honour; this plaque has granted Angelo Micallef a unique form of eternal life. This plaque can be found here.